Paramount, CA – When Paramount High School Green Club members travel to the wetlands at the Bolsa Chica Ecological Reserve to assist the Bolsa Chica Land Trust with their restoration efforts, they have become accustomed to finding the most unusual items deposited in the ecological reserve: shirts, syringes, tires and even a couch. The adverse environmental conditions only strengthen the determination of Green Club members to provide eco-friendly spaces during the twice-annual trips, which allow the students to observe changes in the wetlands and track the progress of the native grasses and scrub bushes they have planted. Now in its 12th year, the 100-member Green Club is active in campus environmental initiatives, heading up Paramount High’s recycling program – bins are in every classroom and members lead a weekly cleanup every Thursday after school – and tending to the school’s community garden, a favorite meeting place for students, who relax among its succulents and hibiscus plants. Green Club field trips to wildlife habitats and nature preserves are a mix of education, community service and relaxation. An annual highlight is a summer camping trip to Yosemite, where students not only work with park rangers and volunteers to perform meadow restoration, but also spend time bonding beneath Yosemite’s spectacular night sky. Paramount High senior Brian Rodriguez has been active in the Green Club for three years and is part of the club’s leadership team, responsible for conducting the campus recycling and garden projects. Rodriguez said communication and outreach are key to promoting environmentalism. 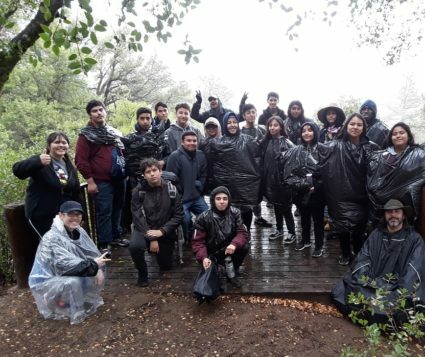 Hasheminejad is a Sierra Club leader and has worked with the Angeles Chapter Sierra Club Inspiring Connections Outdoors (ICO) for nearly 10 years to arrange funding for field trips. The Green Club also uses receipts from its recycling program to raise money for events. 102418_PARAMOUNT_GREENCLUB1: Paramount High School Green Club members enjoy a restoration project at the Bolsa Chica Ecological Reserve. 102418_PARAMOUNT_GREENCLUB2: The Paramount High School Green Club works to improve the environment through planting projects, beach clean-ups and a recycling program. The Paramount High School Green Club works to improve the environment through planting projects, beach clean-ups and a recycling program.